Did you watch Barack Obama accept the Democratic nomination for President last night? It was quite a moment in history to watch this young, African American Senator speak to an audience of some 80,000+ in Denver about his vision for the future. 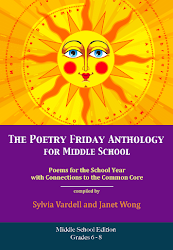 Of course we must make a poem connection! I think this excerpt from a lovely, long poem by Carole Boston Weatherford is perfect. It’s from her poetic homage to African American history, Remember the Bridge (2002), and is the end poem in this striking picture book collection illustrated with amazing iconic photographs and images. who lean on hickory canes. see me to the other side. the future the next span. brothers, sisters, hand in hand. Weatherford, Carole Boston. 2002. Remember the Bridge: Poems of a People. New York: Philomel, p. 50. *Pair Marilyn Nelson’s Carver: A Life In Poems (Front Street, 2001) with Carole Boston Weatherford’s Remember the Bridge (Philomel, 2002). *In honor of Rosa Parks Day, share “Rosa Parks” by Carole Boston Weatherford from Remember the Bridge (Philomel, 2002). And check out Carole's Web site, too! You may remember that her book, Birmingham, 1963 won the Lee Bennett Hopkins award last year. She has a new 2008 book, Becoming Billie Holiday that I'll be reviewing shortly (I loved it!). 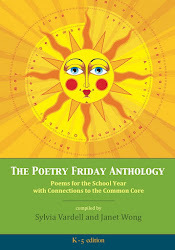 For more Poetry Friday fun, go to Charlotte's Library. In my neck of the woods, it’s time to head back to school. It’s still 98 degrees here in Texas, but for many kids, summer is already over! 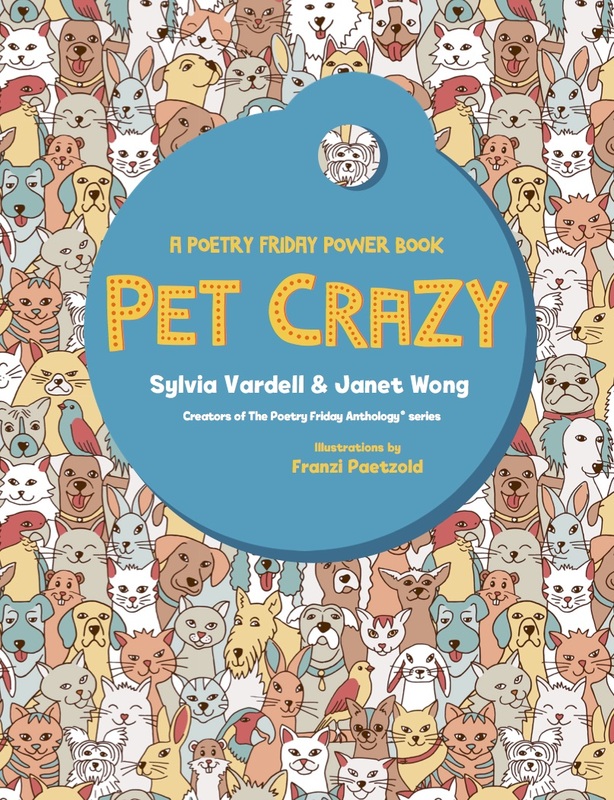 So, let’s take a look at three new poetry books that are kid-friendly collections with poetic forms that kids are sure to imitate. 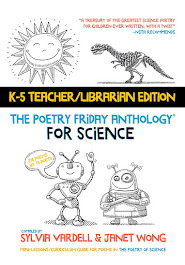 Strong on rhyme and humor, with odd or interesting illustrations, these are worth checking out. who loved a little lima bean. and only took it out to brag. Rovetch, Gerda. 2008. There Was a Man Who Loved a Rat; And Other Vile Little Poems. New York: Philomel. Of course, being from Texas, this poem particularly appeals to me (since Abilene is a Texas town). But I can also see using this limerick-like quatrain form with kids, as they try their hands at creating nonsense poems. Put a lima bean in a small velvet (jewelry) bag and present it mysteriously before reading the poem aloud. Look at Vern: he’s always venting. Put his victims in a panic. Aimed his venom at a snake. Ashman, Linda. 2008. 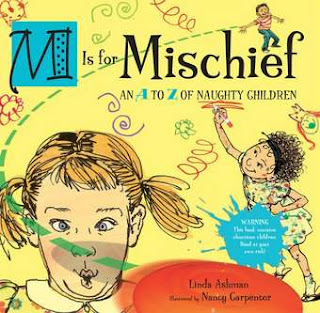 M is for Mischief; An A to Z of Naughty Children. New York: Dutton. There’s a long tradition of rhymes and verses about “bad” kids including X. J. Kennedy’s wonderful/horrible “Brats” collections. And of course kids may enjoy seeking out other ABC books that use first names as their structure—like A my name is Alice, Alice to Zinnia, etc. Elliott, David. 2008. On the Farm. Cambridge, MA: Candlewick. This Elliott and Meade collaboration reminds me of the large image, oversized picture books of Flora McDonnell, particularly I Love Animals (Candlewick, 1996) a perfect companion to this book. Or look for the classic Big Red Barn by Margaret Wise Brown or Mother Goose collections of animal rhymes. And of course young children will love making animal noises and animal movements to accompany the read aloud. For more Poetry Friday poetry, go to Big A Little A-- thanks for hosting, Kelly! I’m always eager to find poetry from the voices of indigenous poets. 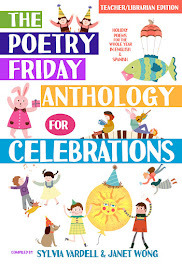 Thus, I was so pleased to see poems by Māori poets in the wonderful Kiwi collection of poetry for young people from New Zealand, Poetry Pudding. Here’s one that just begs to be read aloud. It's a poem that captures the Māori legend of Māui fishing up Te Ika (the North Island). I think children of any culture would love the musicality of these lines. Argante, Jenny. Ed. 2007. Poetry Pudding; A Delicious Collection of Rhyme and Wit. Ill. by Debbie Tipuna. Auckland, NZ: Reed Publishing, p. 105. 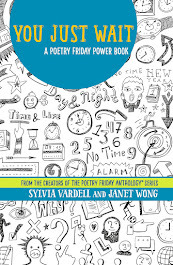 Poetry Pudding includes a sprinkling of small black and white illustrations that do not distract from the poems. And there’s a fun font and placement of words on the page, usually centered on the page with generous margins, creating an inviting look and feel. It also includes a table of contents, index of poets, and index of first lines—always helpful. All in all, I’m so glad I sought out this collection all the way from New Zealand. 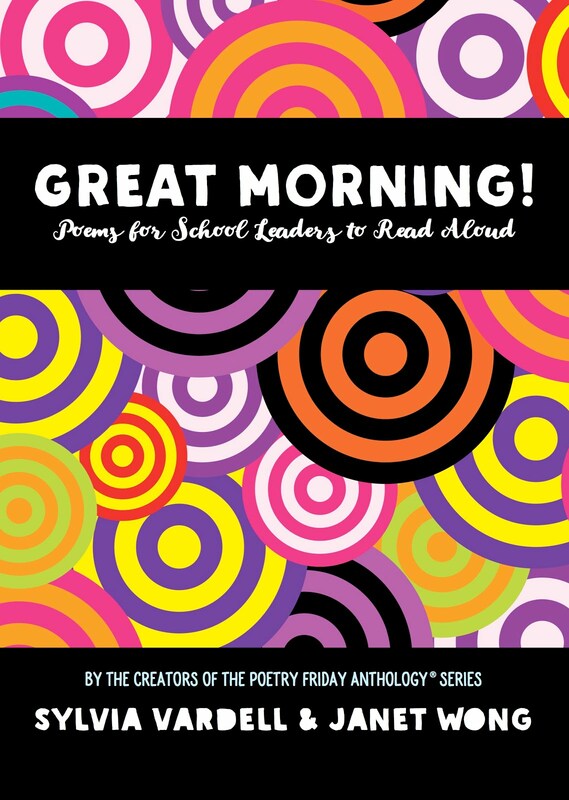 It’s reassuring and exhilarating to connect with others who value poetry for young people! As the Summer Olympics begin on this auspicious date, 08/08/08, our attention is focused across the globe. I thought it might be appropriate to spend a moment on an international poem collection, Poetry Pudding, from New Zealand. 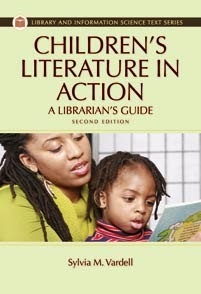 I first found out about this gem from a CHILD_LIT listserv posting this spring. The Storylines Children’s Literature Trust selects an annual list of New Zealand’s notable books for children chosen by a panel of children’s literature professionals including past and present members of the Storylines management committee, all of whom have a wealth of experience and knowledge in the field of children’s literature. Many have served as judges for the New Zealand Post Book Awards (and its previous incarnations) and the LIANZA children’s book awards. The list (launched in 1999) comprises 10 books in each of four categories – picture books, junior and young adult fiction and nonfiction. These books represent the very best books for young people published in New Zealand during the previous year (2007). Poetry Pudding did not disappoint. Its small trim size (roughly 4.5 x 6.5 inches) is fun and handy, easy to tote and tuck into a bookbag, purse, or pocket, and it contains over 100 poems from 44 contributors from some of New Zealand’s best and most interesting poets: Cliff Fell, David Hill, Jack Ross, James Brown, Paula Green, Jessica Le Bas, James Norcliffe, and many others. In her introduction, Jenny Argante explains that her aim was to collect poems by “Kiwi poets for Kiwi kids” organized around the alphabet, A to Z, but it didn’t quite work out. 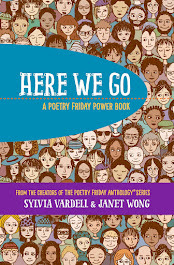 She writes, “In poetry… where you start from is not as important as where you end up” (p. 11). Love that line! 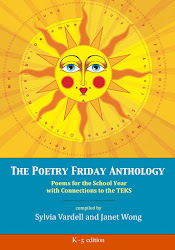 The selections represent an amazing range, including poems by Maori poets. I found it impossible to select just one example, so I’ll be posting my favorites over the next three days, just for fun. Here are three gems to show the contrast in tone, style, and form in this excellent anthology. Argante, Jenny. Ed. 2007. Poetry Pudding; A Delicious Collection of Rhyme and Wit. Ill. by Debbie Tipuna. Auckland, NZ: Reed Publishing. 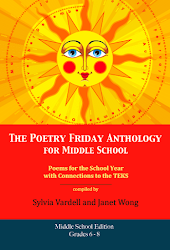 Poetry Friday is hosted by my former student, Becky Laney, this week at Becky's Book Reviews. Go, Becky!